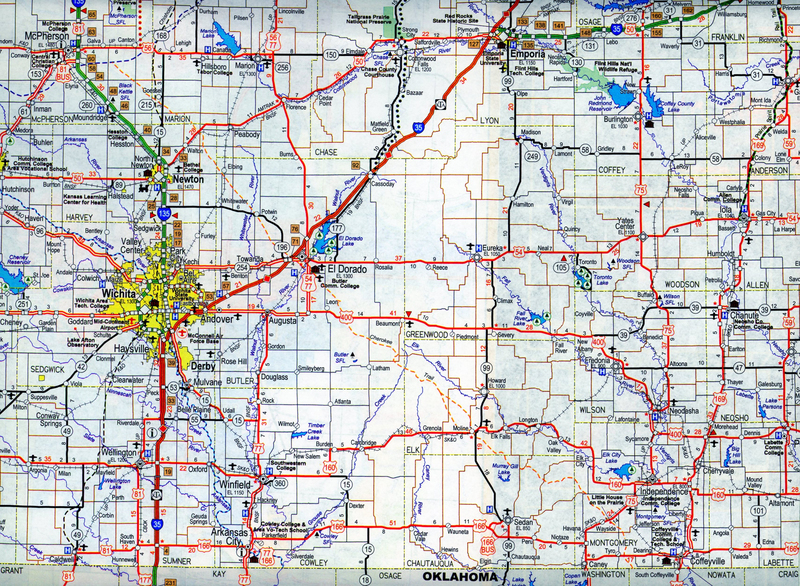 The map above is just an overview map indicationg points of interest along the Kansas section of the Cherokee Trail. 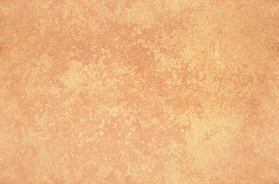 More accurate maps are the driving the trail with the link to that at the end of this webpage. Much of the Cherokee Trail is located the the Flint Hills one of the physiographic regions of Kansas. To learn more about this lovely region of our state, Click Here. Much of this area hasn't change since the Cherokee Trail days. In 1849 a group of whites from Washington County, Arkansas, and Cherokee from the Nation rendezvoused on the Grand (Neosho) River at the Grand Saline for the sole purpose of going to the California Goldfields. There they elected officers with Lewis Evans of Evansville, Ark. as Captain. Under his leadership the forty-wagon train pioneered the first wagon road northwest through northeastern Oklahoma, crossing the Verdigris River southwest of Coody’s Bluff. Entering south central Kansas in present Montgomery County they traveled on the highlands between the Verdigris and Caney Rivers. They crossed the Walnut River at present El Dorado. “There is one great advantage in going with the Cherokee company. The Cherokees are on the friendliest terms with all the Indian tribes of the Prairie – consequently there will be no danger of attacks from our red brethren.” On this trail from Oklahoma through Kansas to the Santa Fe Trail, all travel was on the ridges between waterways where possible. In addition, this company had been warned they would have to face Comanches and Pawnees before they reached the Rocky Mountains. Traveling the ridges gave them the ability to see long distances, a defense strategy perhaps born of Cherokee experience. The combined company, made up of people from Cherokee Nation, plus both whites and Cherokee from Arkansas, Missouri, and Tennessee became known as the Evans/Cherokee Company. The Evans/Cherokee Company had just completed the first-ever wagon traverse of the road, from Arkansas through Indian Territory and future Kansas to Galva. Proceeding west along the Santa Fe Trail, in the forefront of the California emigration, they went to Bents Fort (CO). Leaving the Santa Fe Trail the train continued west up the Arkansas River to Pueblo. The Captain Evans/Cherokee wagon company, joined by other wagons, proceeded from Pueblo north along the front range of the Rocky Mountains on the old Trappers or Divide Trail. This trail, east of Colorado Springs, ran over “the divide” between the Arkansas and South Platte Rivers, and down Cherry Creek to the South Platte where Denver now stands. Traveling northeast along the South Platte to the confluence of the Cache la Poudre River near Greeley, the Evans/Cherokee wagon train left the trading forts’ trace, forded the South Platte and proceeded west. With no guide, they again pioneered the wagon road from the crossing of the South Platte to Fort Bridger. CHAUTAUQUA COUNTY CLASS 1 RUTS ON HAY MEADOW - 1655 Road 28, Elk City - Ruts are visible after a burn on this hay meadow owned by Jim and Diana Beason, who received the Friends of the Trail Award at the Octa Convention in Lawrence, KS in 2012 for their outstanding efforts in preserving and maintaining historical trail resources. ELK COUNTY MT OLIVET CEMETERY - East side of K99 one half mile south of Moline - The trail is west of the highway running from SE to NW towards the farmstead as you look NW SWINGING BRIDGE AT MOLINE - 515 N Biddle Street - This footbridge built in 1904 crosses Wildcat Creek. The Cherokee Trail crossed near the bridge. FIRST SURVEYED ROAD CROSSING - On Limestone Road approximately 3/8 of a mile east of Limestone and Road 7. The trail crosses from the gate on the left to the two bare trees and utility pole on the right. This is the furthest south spot that the trail is marked crossing a section line and drawn in on the GLO maps. The country south of here was part of the Osage Diminished Reserve. GREEN RANCH - 7 ½ miles east of Latham - A spectacular view looking east along Pioneer from just east of the entrance to the Green Ranch is from the highest place in the southern flint Hills with an elevation of just over 1650 feet. This hill drops 200 feet in less than a half mile, and 300 feet in about 1.1 mile. The Cherokee Trail crossed here about 1/4 mile to the west of the entrance. BUTLER COUNTY WAYSIDE STATION OF 1850S, 89 20 Ave, El th Dorado This stone house was built in the 1850s and used as a way station for the travelers on the Cherokee Trail. The storekeeper had his goods on the main floor. There was an opening in the ceiling with a ladder that he used to go upstairs to his sleeping quarters. CONNER CABIN AT KANSAS OIL MUSEUM, EL DORADO, KS - Built in 1857 by William Hilderbrand and purchased by J. D. Conner in 1858. He used the cabin as a trading post supplying the Indians and the few white settlers with essentials and a few luxuries, as well as people traveling the Cherokee Trail. CLASS 1 RUTS AT POTWIN - Located on the north edge of Potwin at 80 Street and Munson. HARVEY COUNTY TOWNSHIP 9, WALTON TOWNSHIP - Hwy 50 and NE Lake Road - Buffalo Chip Camp on the Cherokee Trail - “Not a stick of wood can be seen with miles of us and for the first time our fires are built and suppers cooked with Bois de Vache, or ‘buffalo chips’ as the soldiers call this species of fuel.” ...Cherokee Trail Diaries Several ruts can be seen in this pasture from other trails that traveled through it, though they are not from the Cherokee Trail. GOESSEL MONUMENT - On K15, 5 1/4 miles south of Goessel. The only monument in Kansas about the Cherokee Trail. WOLF CREEK CAMP - 1135 N Alamo Rd, Goessel - Described in the Cherokee Trail Diaries as a very cold sluggish stream. MCPHERSON COUNTY LAST SURVEYED CROSSING - ½ mile north of Cimarron Rd on 27 Ave, Canton. For some reason the last several miles of the Cherokee Trail does not show up on surveyors’ maps. CHEROKEE JOINS THE SANTA FE TRAIL TO BENTS’ OLD FORT AT RUNNING TURKEY CREEK - 21st Ave and Iron Horse Rd, Galva - East side of Creek. 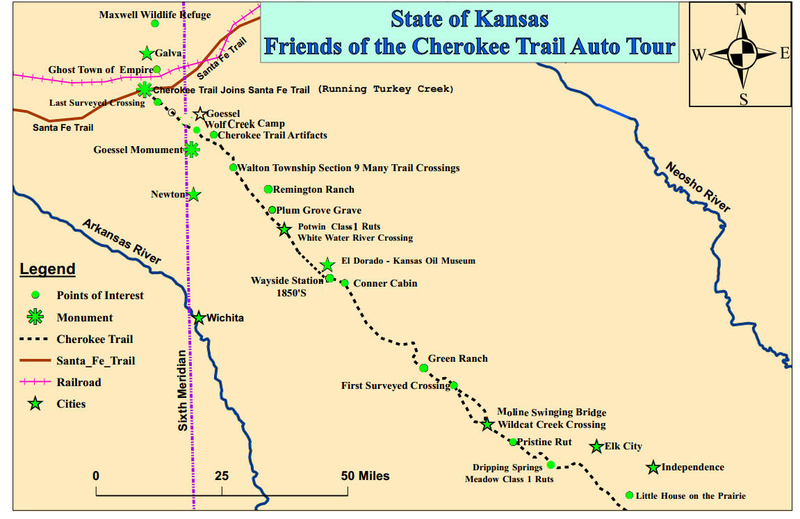 If you would like to have maps to drive the Cherokee Trail, Click Here.